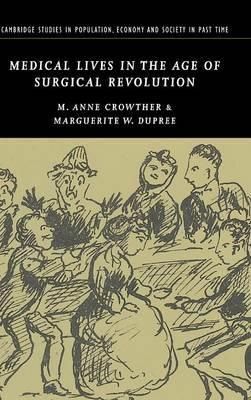 Medical Lives In The Age Of Surgical Revolution Hc. This book is an unusual history of doctors trained in Britain in the last quarter of the nineteenth century, and their careers in Britain and the empire. Anne Crowther and Marguerite Dupree describe the experience of a whole generation of doctors at a time of rapid changes in medical knowledge. This book is an unusual history of doctors trained in Britain in the last quarter of the nineteenth century, and their careers in Britain and the empire. Anne Crowther and Marguerite Dupree describe the experience of a whole generation of doctors at a time of rapid changes in medical knowledge. Amongst them were Sophia Jex-Blake and the first group of medical women in Britain. Many became disciples of Joseph Lister as he trained them in his new methods of antiseptic surgery. Surgery was not confined to specialists, and Lister's methods were adapted to suit hospitals and households, peace and war. The medical schools were tools of the Empire, sending students into general practice, military service, the mission fields, high-class consultancies and homeopathy in many lands. The book highlights the importance of medical networks - both male and female - and shows how doctors adapted to new methods in their profession.